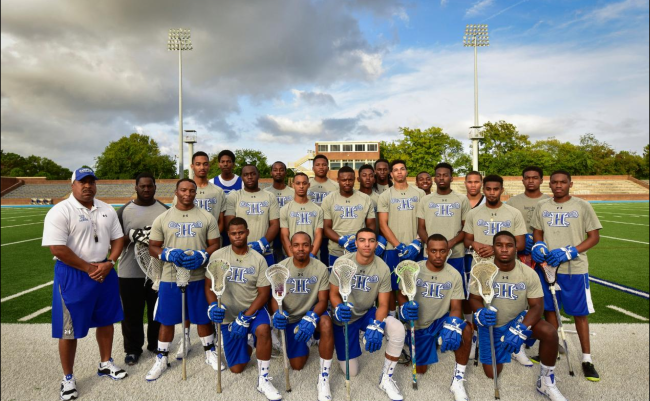 Hampton University’s historic 2015-2016 men’s lacrosse team. Corey McLaughlin of Lacrosse Magazine is reporting that history was made on Saturday, as the Hampton men’s lacrosse team became the first from a historically black college or university to debut at the NCAA Division I men’s level. Led by Coach Lloyd Carter, a Morgan State University alumnus, The Pirates also became the first HBCU since Morgan State in 1981 to field a varsity men’s team in the sport. “The Hampton story was featured on the November cover of Lacrosse Magazine, with the headline, “It’s real,” the team’s slogan — sometimes sung by Carter and the players — in reference to the historical significance and the quick transition from a relatively young club program to a varsity sport in just one offseason. The team was the dream of a former Hampton student, Michael Crawford, who died in December 2010 of an undiagnosed enlarged heart, one semester short of graduation. He wanted to start a club team at Hampton. His mother, Verina, saw to it that it happened, seeing the project through the Hampton administration. ESPN broadcast the first hour of the historic game live from Armstrong stadium on Hampton University’s campus; the second hour of the game was broadcast on ESPN2. The Pirates lost to Roberts Wesleyan 20 – 3. Click here for Logan Whitton’s photo gallery of the Hampton University Pirates men’s lacrosse team. Read more at Lacrosse Magazine or Richmond.com.